Today my friend Alex and I were at Cedar Point for Opening Day. It was Alex's first ever visit to the park. First I had to get my season pass processed, which took about forty-five minutes with the long line. Then we were off to the rides. We rode maXair, Disaster Transport, Corkscrew, Magnum and Gemini before lunch. We ate at T.G.I. Fridays in the Breakers Hotel. I had great burger and sweet potato fries. 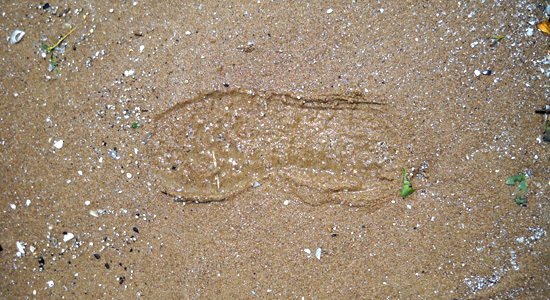 Before we returned to the park I wanted to get another footprint picture for my collection. So we ran out to the Lake Erie beach for a quick photo. We were back in the park and ready for more rides. 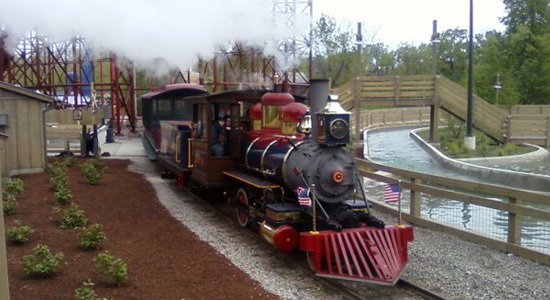 During the afternoon we rode Wildcat, Iron Dragon and Cedar Point and Lake Erie Railroad. We both waited in line for an hour and a half to ride Millennium Force. When we got to the very front of the line, Alex chickened out and didn't ride. I, of course, had a great lap on Millie. For dinner we ate at Famous Dave's. I had pulled pork, corn on the cob, mashed sweet potatoes, baked apples and cornbread. We completed our day at Cedar Point with rides on Blue Streak, Cedar Creek Mine Ride, Paddlewheel Excursions and another trip on the Cedar Point and Lake Erie Railroad. We also checked out the lights and sounds of Starlight Experience. Even though it wasn't official running with all of the set pieces in place, we we still a cool thing to take in. The sun had set on our clear and warm opening day at Cedar Point. And now the cool air and beautiful park lights were dibbing us a good evening.